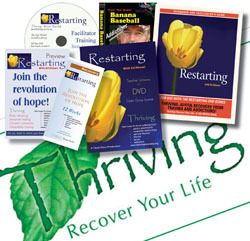 Includes the Restarting DVD set (described below), Joy the Revolution of Hope DVD, 10 Restarting brochures, 1 Restarting Facilitator Workbook and the 12 module training sessions.. This four DVD set of lessons and exercises was filmed in beautiful nature settings and provides almost seven hours (6:52) of life-changing instruction for the 12 weekly sessions of Restarting. Restarting is the first module of the Connexus for thriving community program. Restarting offers new hope for those suffering from painful attachments, weakened relationships, spiritual dryness, trauma, abuse, or addictions. The Restarting Student License Video is designed to work with the Restarting Workbook, the, Banana Baseball DVD and Join the revolution of hope! DVD to provide a new future for recovery. Restarting: A revolutionary solution-based approach for building joy, receiving inner healing, and developing life-giving relationships. Advancing beyond traditional treatment, current support group methods, and secular or spiritual approaches to recovery, Restarting offers hope for those that have tried other approaches and still feel hurt, empty, alone, and ashamed of their struggles and behaviors. Restart your recovery for the first time! Week 1 Train Your Brain for Change! Week 12 The Blueprint for a New You! Brain retraining, Immanuel healing, Christian community and discipleship training.